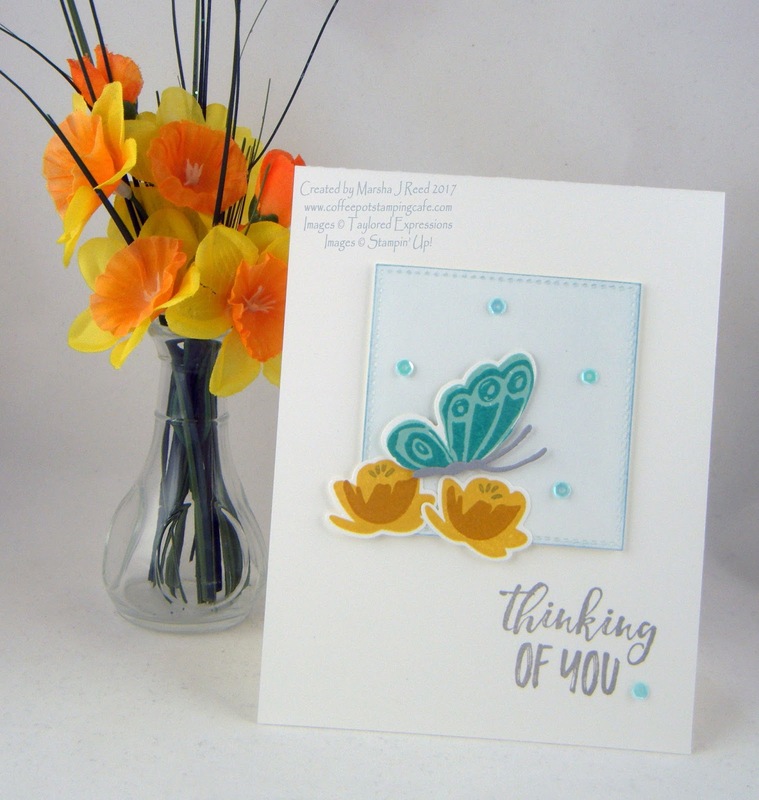 The sky is blue, the sun is shining and I'm in my craft room where I combined three challenges to make this clean and simple thinking of you card. A day doesn't get any better than this! 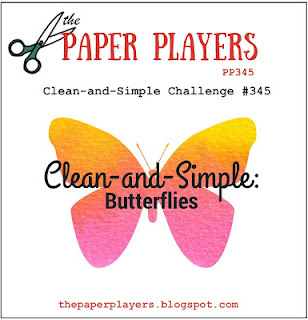 The clean and simple butterflies theme I used is from The Paper Players Challenge. 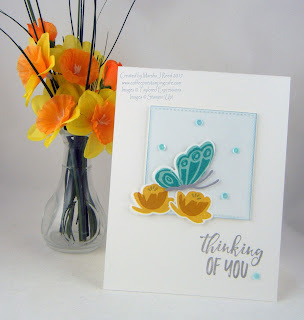 I love the Simply Stamped - Butterflies stamp set and dies from Taylored Expressions. It has so many wonderful butterfly images from which to choose. The sketch I used is from the Freshly Made Sketches Challenge. I loved the simplicity of the sketch. 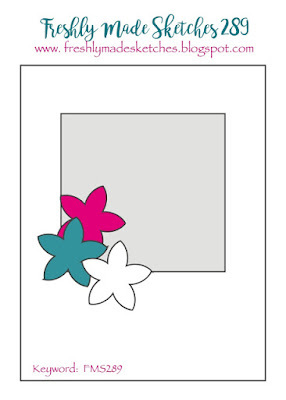 I don't often use squares in my designs, but the Stitched Shapes Framelits Dies from Stampin' Up! were perfect for the square layer. The colors I used are from the Sunday Stamps Challenge. Such pretty colors for this color challenge. I used five of the colors but two of them looked different when I printed the graphic out so they are more in the yellow family than the green family. 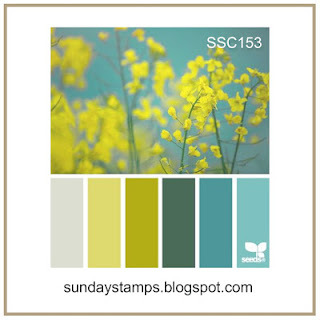 The Bermuda Bay, Pool Party, Delightful Dijon and Crushed Curry inks from Stampin' Up! all worked so well together. This is so pretty! Love that sweet butterfly with the blooms! Glad you joined us at FMS! Thanks, Linda! Had to play with my new butterflies stamp and dies. Simply stunning! Love the colors with your images, perfectly created! Thanks for joining us at Sunday Stamps, hope to see you again soon! Thanks, Amy! Great colors to work with and ones I don't often use together. Wow, you combined these three challenges beautiful! Gorgeous creation! Thanks, LeAnne. I don't often combine three but I do like the way this one turned out. Beautiful! I am loving those colours together!! Thanks for playing with us at the Paper Players. Thanks, Deanne! I love butterflies and knew I had to play along. I love your mix of two flowers and a butterfly - they look fabulous together even if from different companies!! Thank you for playing along with us at Freshly Made Sketches. Beautiful clean card, Marsha! The blue sequins really add a lovely highlight. Thanks for joining Sunday Stamps! Thanks, Heidi! I seem to have developed a need to put sequins on several of the cards I've made lately.